Wish you all Happy Vinayaka Chavithi !! Back home in India, they used to put a big Ganesh Idol in the temple premises in our colony. I used to go there along with my friends after school to have prasadam 🙂 Most of the days, they used to give chakkar pongal as prasadam. It used to taste divine with light karpuram(camphor) flavor. Heat 2 Tbsp of Ghee in a large deep pot or a pressure cooker. Add Moong dal, and fry for a min, till emits nice aroma and turns to light brown color. Cook till done, stirring in between to avoid burning. 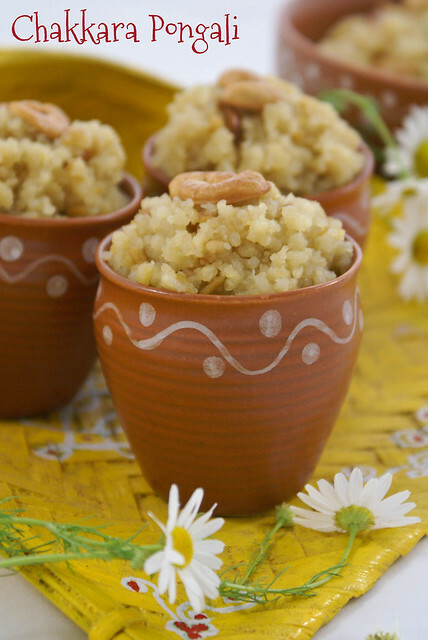 Simultaneously, in a medium sized pan, melt sugar, jaggery in half cup water. Strain to remove any impurities. Turn the heat of the Rice and dal mixture to low, and add the syrup. Mix well. Now add karpooram and mix well. Instead of 3 cups of water, you can use 2 cups water and 1 cup milk. Quantity of Sugar and be increased or decreased according to taste. If you do not have edible camphor, add powdered cardamom. You can even add Raisins or pieces of dry coconut (roasted in ghee) to garnish. They look so tasty and i can't take my eyes off the matkas.. such lovely props ! Came here through my friend's blog. And really enjoying going through your previous posts. Your chicken 65 is tempting me to try it right now !! Superb collection of recipes with equally very nice pictures. Oh..those pots are so cute..and lovely presentation! what a pretty post with all those rangolied mudkas – Lovely! 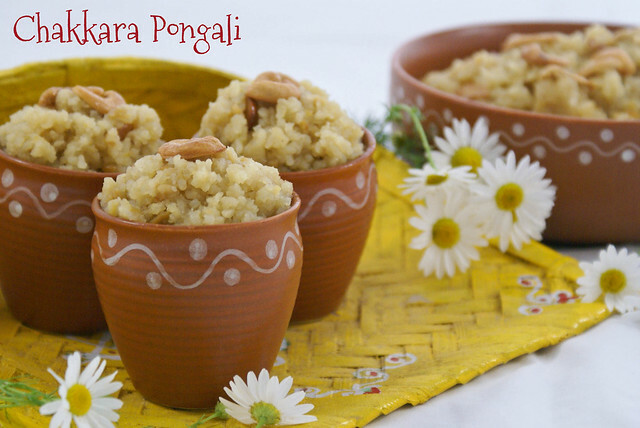 The pongal looks beautiful, so festive and inviting! you have one beautiful blog. the pongali looks wonderful Spandana. Love the presentation!! Way to go!